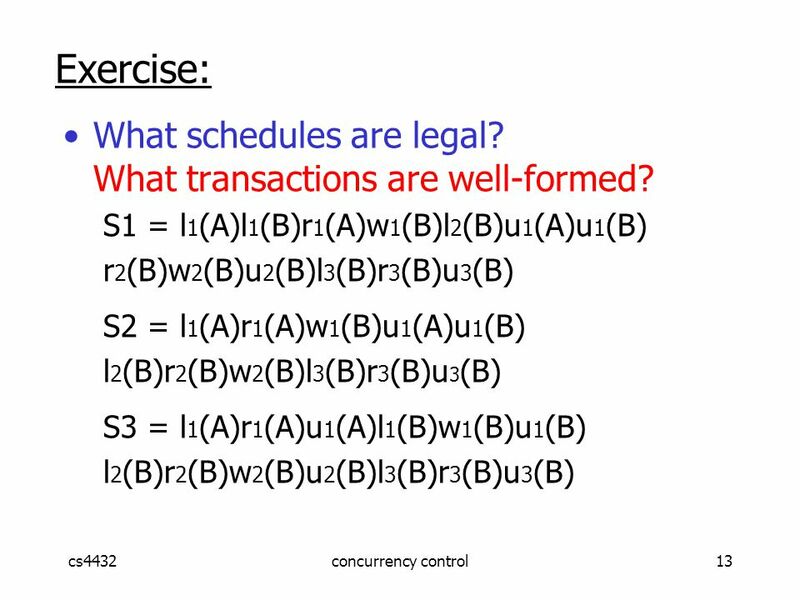 3 cs4432concurrency control3 Concepts Transaction: sequence of r i (x), w i (x) actions Conflicting actions: read/write on same resource A. 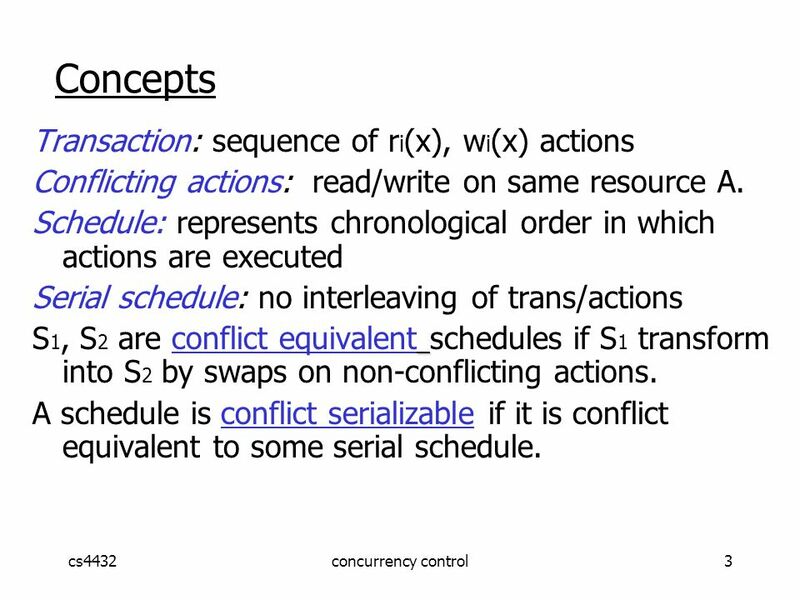 Schedule: represents chronological order in which actions are executed Serial schedule: no interleaving of trans/actions S 1, S 2 are conflict equivalent schedules if S 1 transform into S 2 by swaps on non-conflicting actions. 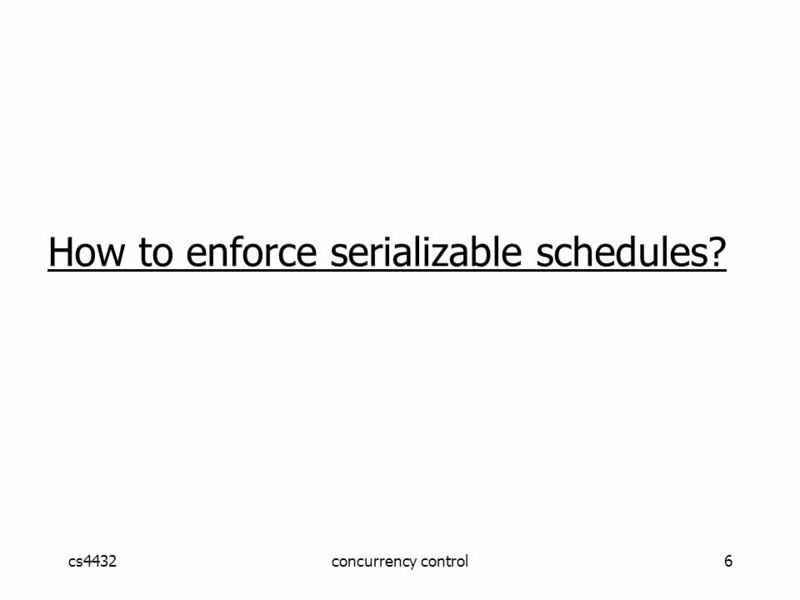 A schedule is conflict serializable if it is conflict equivalent to some serial schedule. 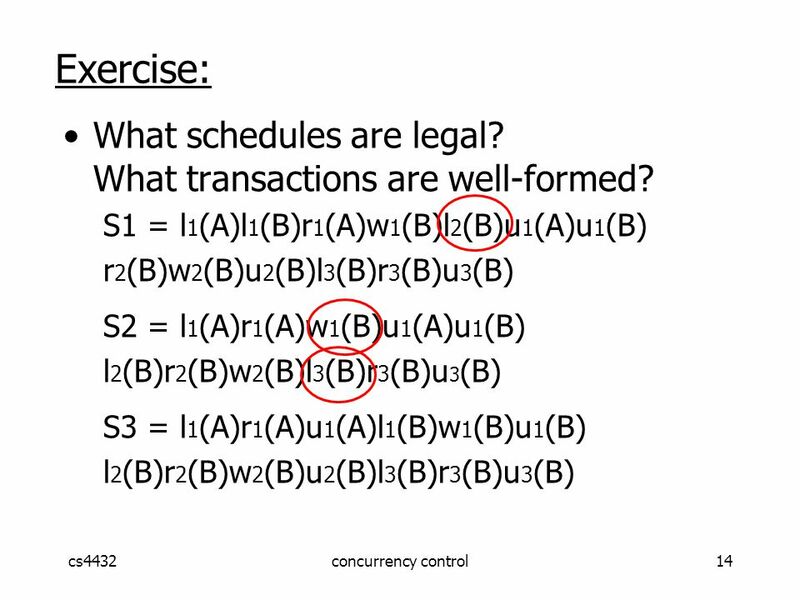 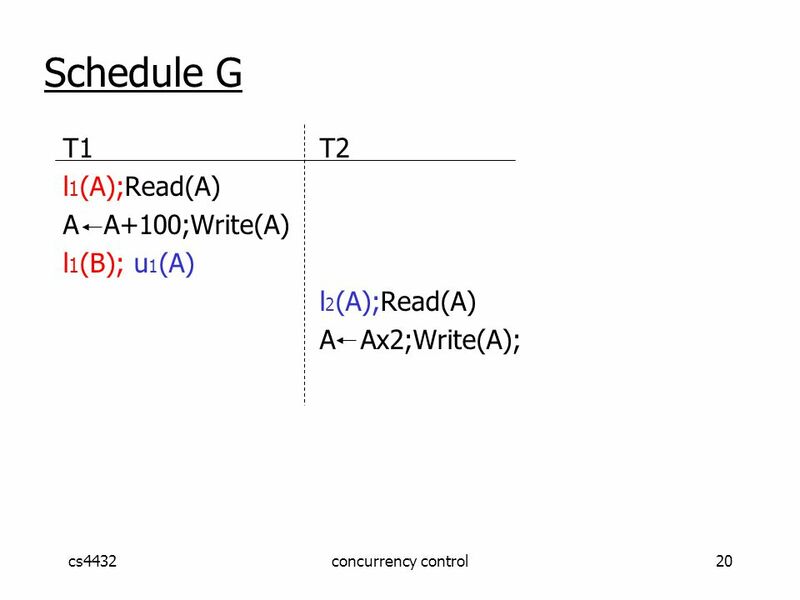 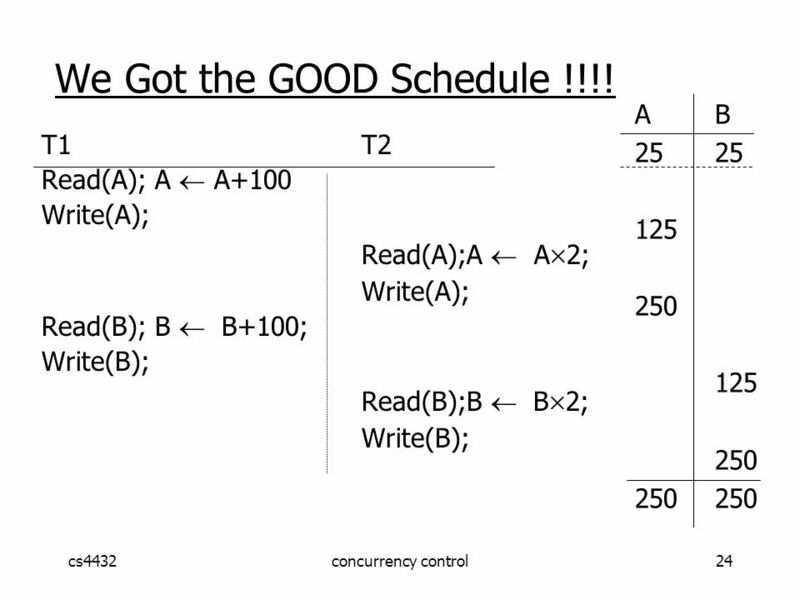 6 cs4432concurrency control6 How to enforce serializable schedules? 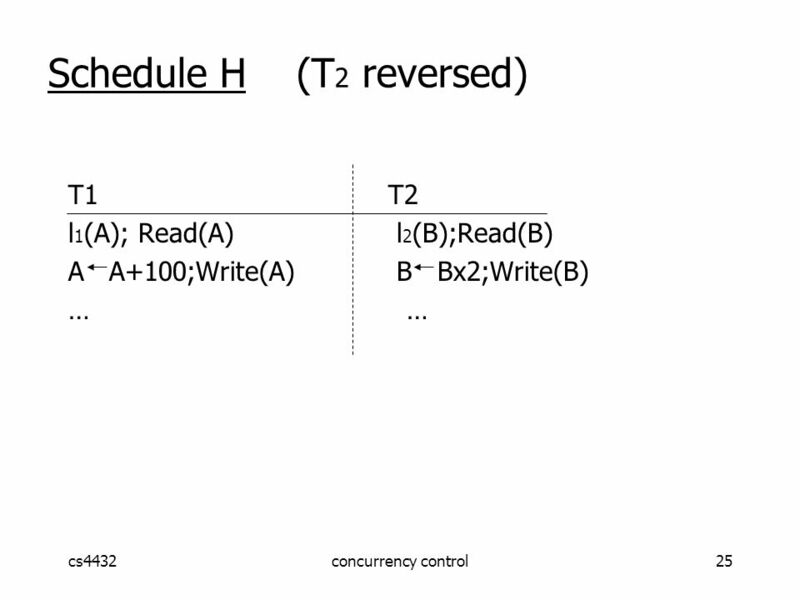 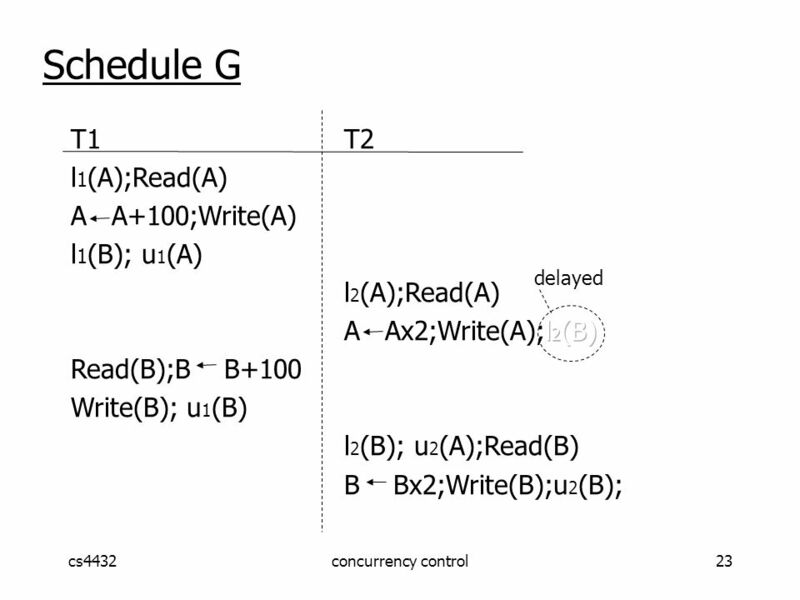 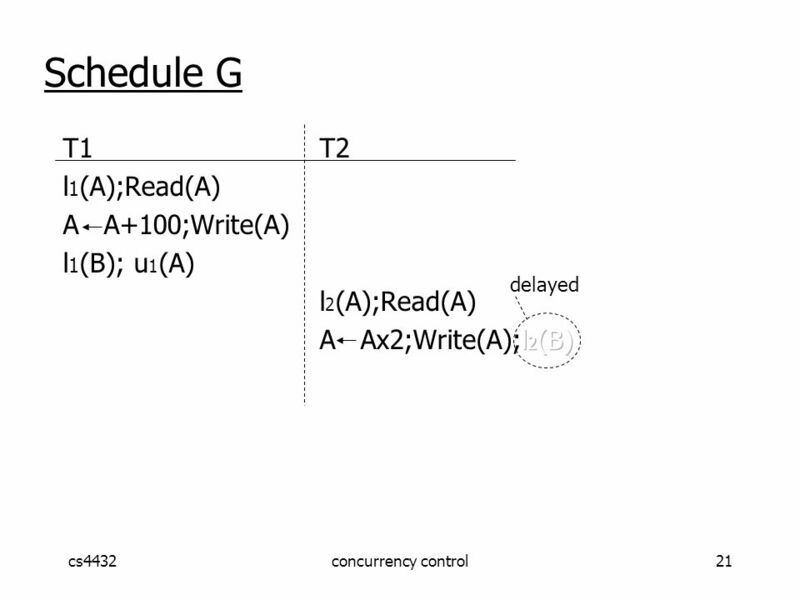 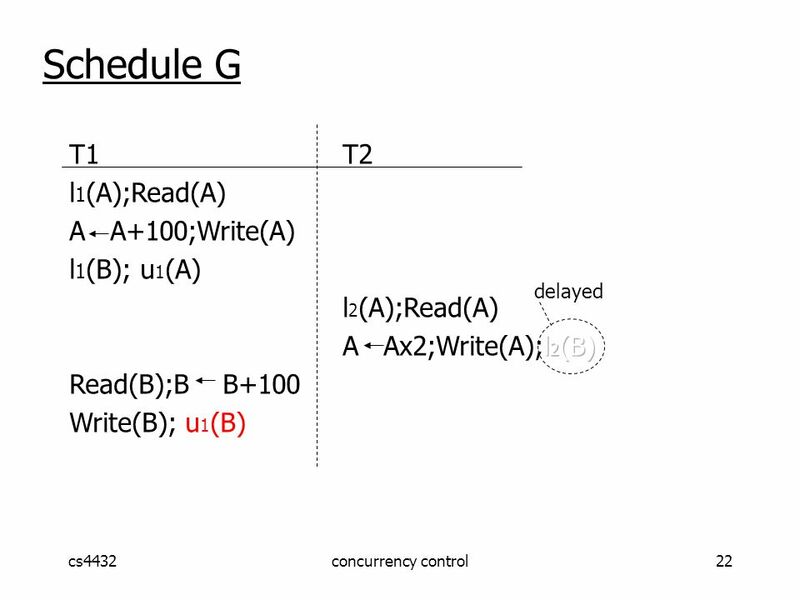 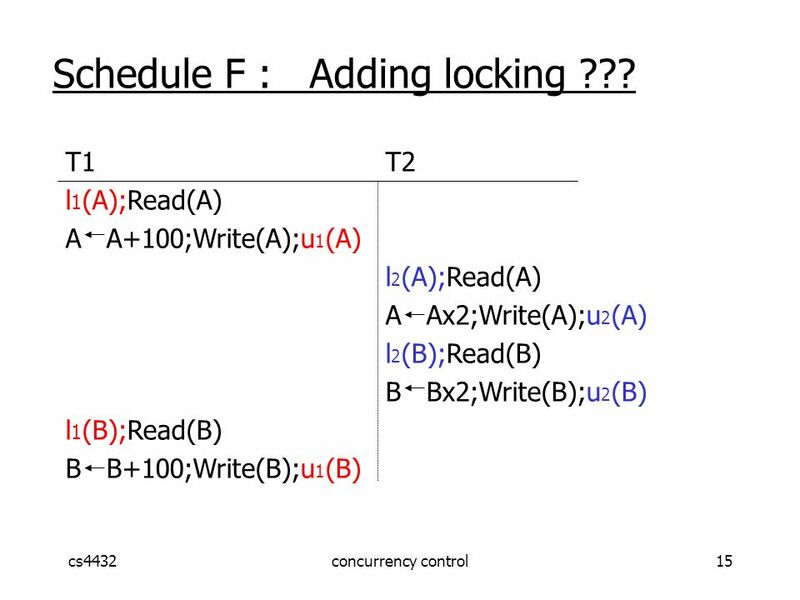 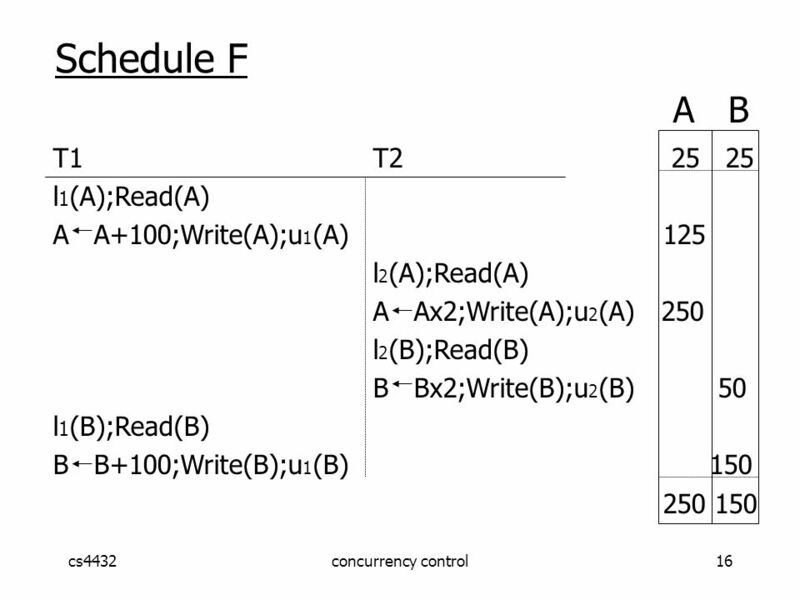 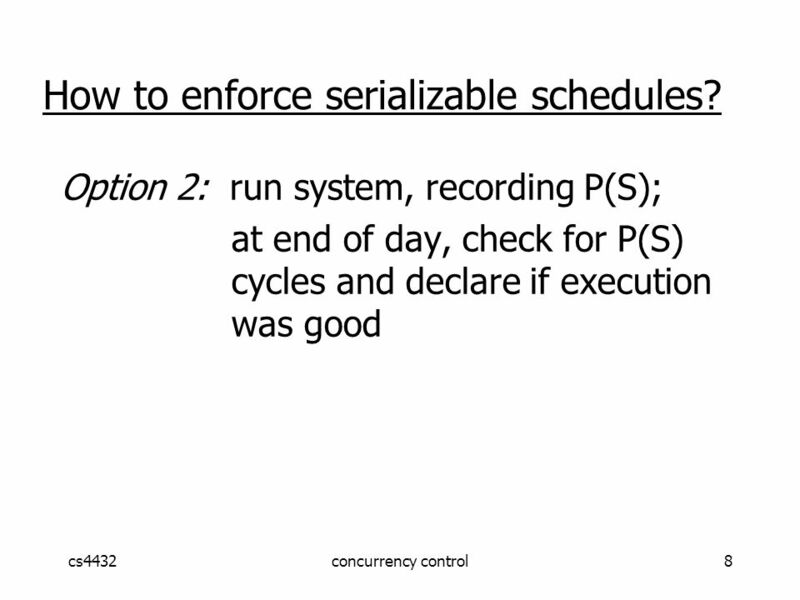 7 cs4432concurrency control7 How to enforce serializable schedules? 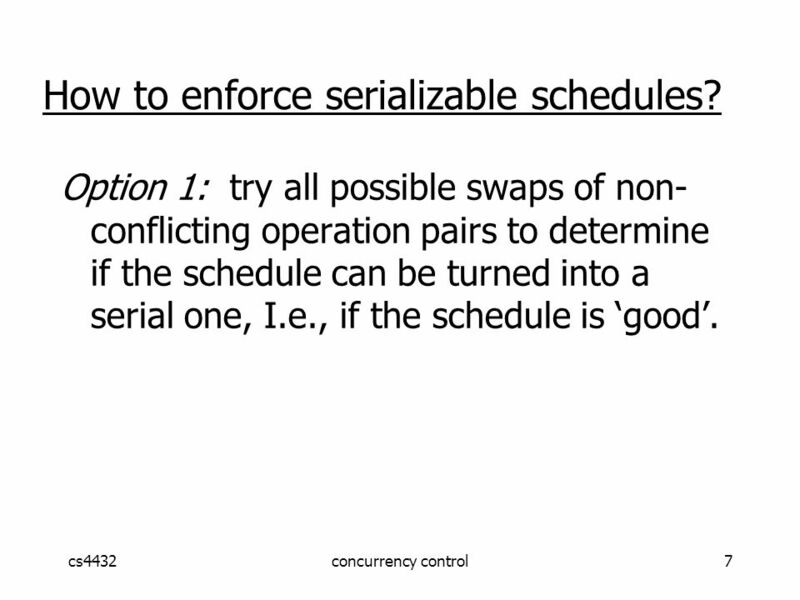 Option 1: try all possible swaps of non- conflicting operation pairs to determine if the schedule can be turned into a serial one, I.e., if the schedule is ‘good’. 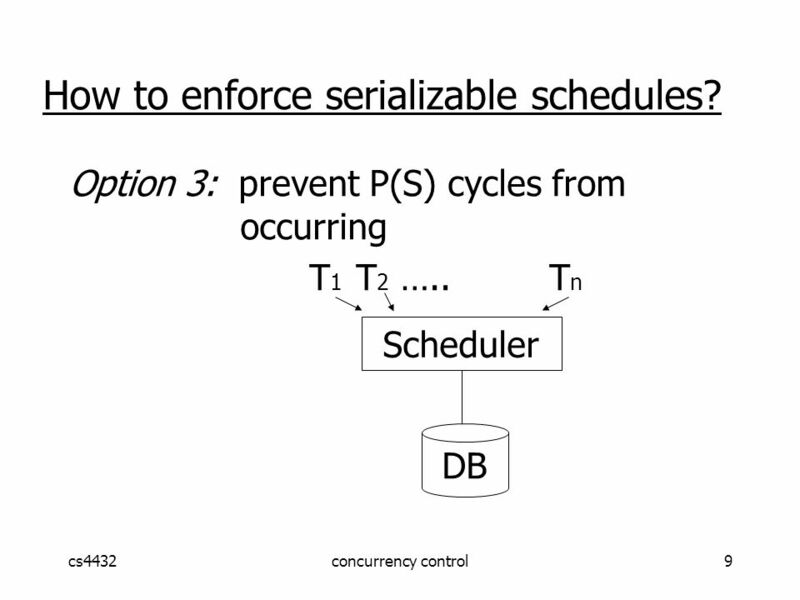 9 cs4432concurrency control9 Option 3: prevent P(S) cycles from occurring T 1 T 2 …..T n Scheduler DB How to enforce serializable schedules? 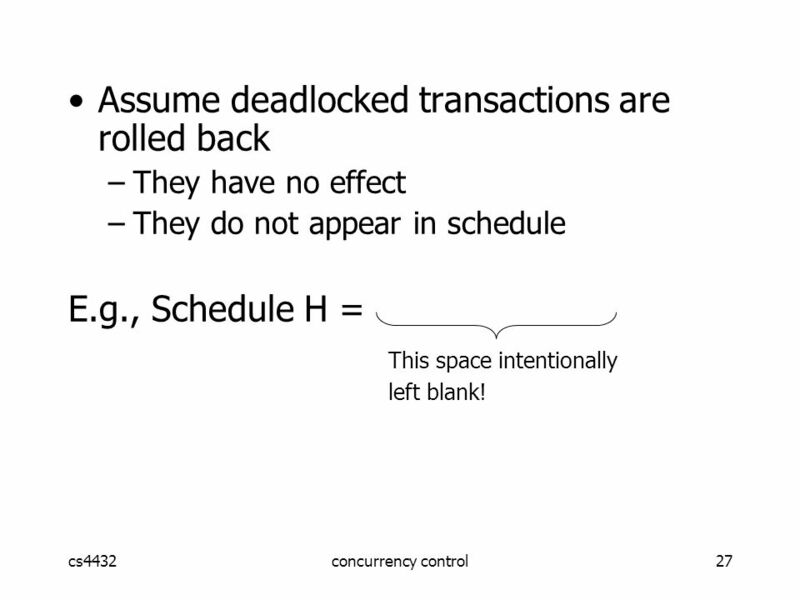 27 cs4432concurrency control27 Assume deadlocked transactions are rolled back –They have no effect –They do not appear in schedule E.g., Schedule H = This space intentionally left blank! 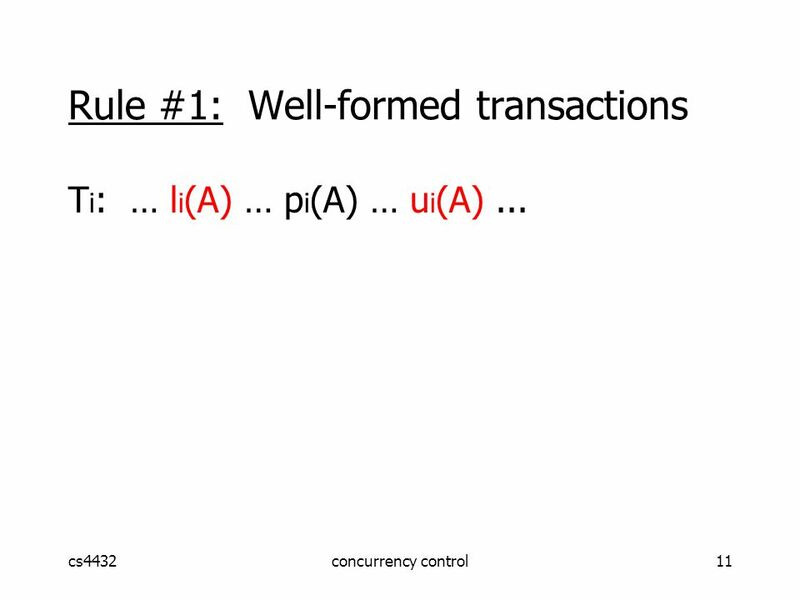 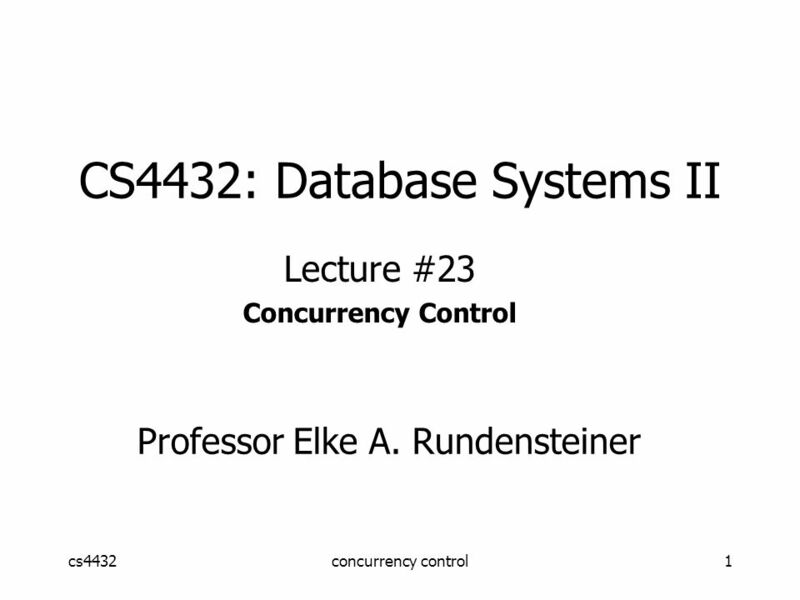 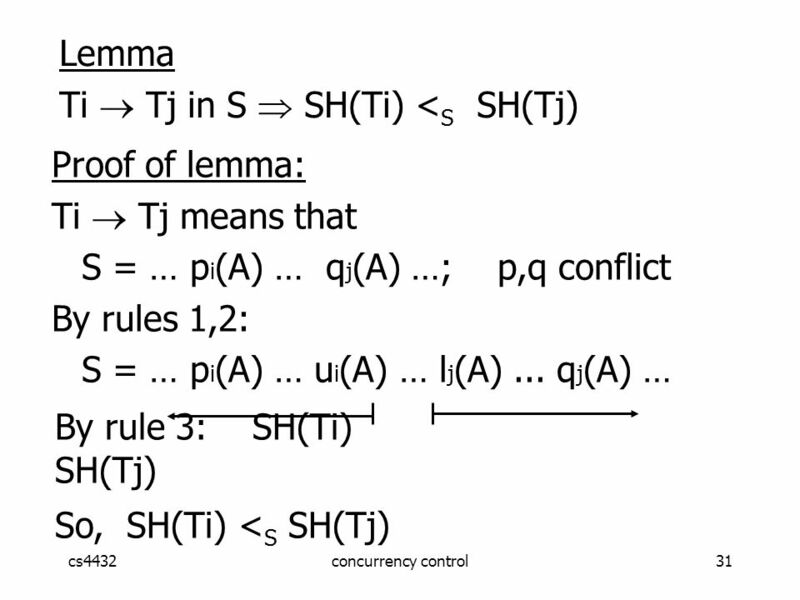 Download ppt "Cs4432concurrency control1 CS4432: Database Systems II Lecture #23 Concurrency Control Professor Elke A. 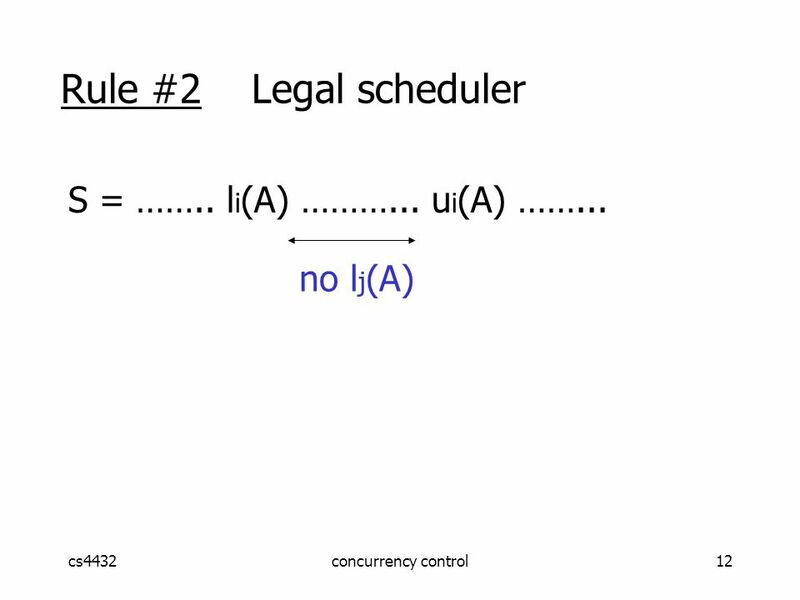 Rundensteiner." 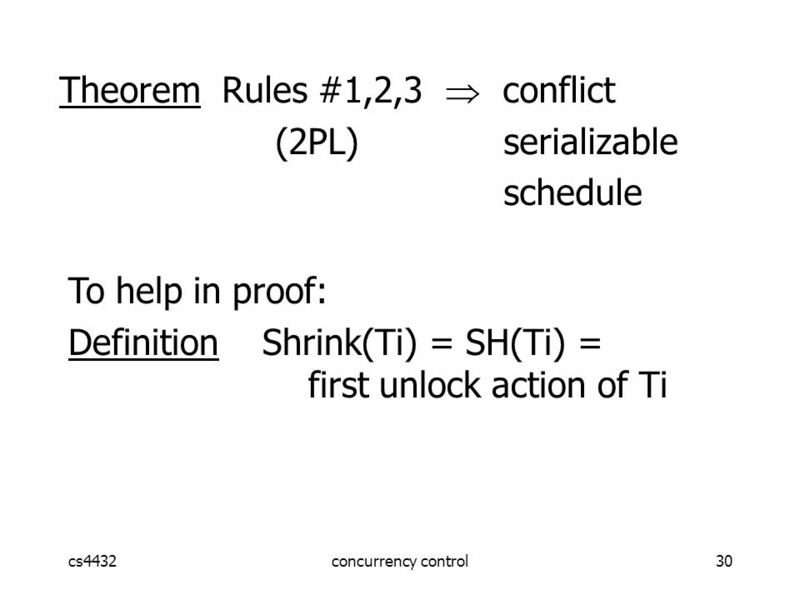 1 Concurrency Control III Dead Lock Time Stamp Ordering Validation Scheme. 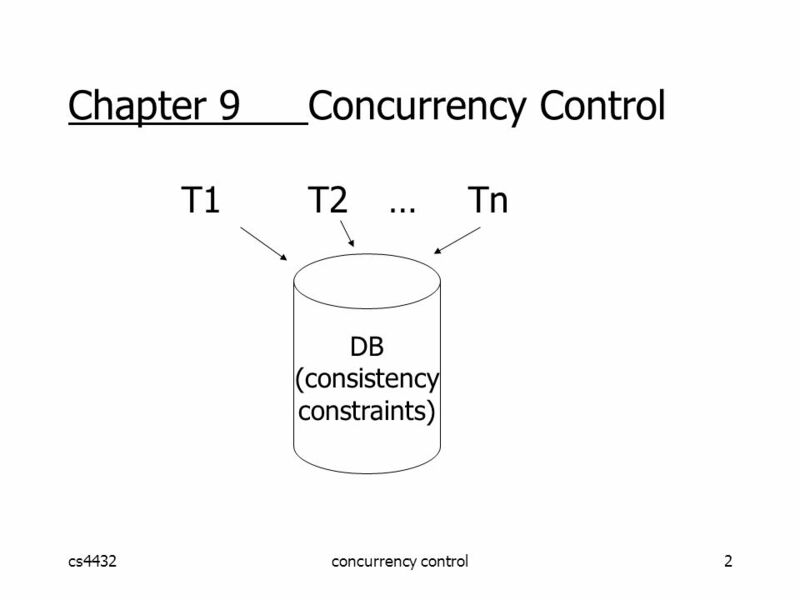 1 Concurrency Control Chapter Conflict Serializable Schedules  Two actions are in conflict if  they operate on the same DB item,  they belong. 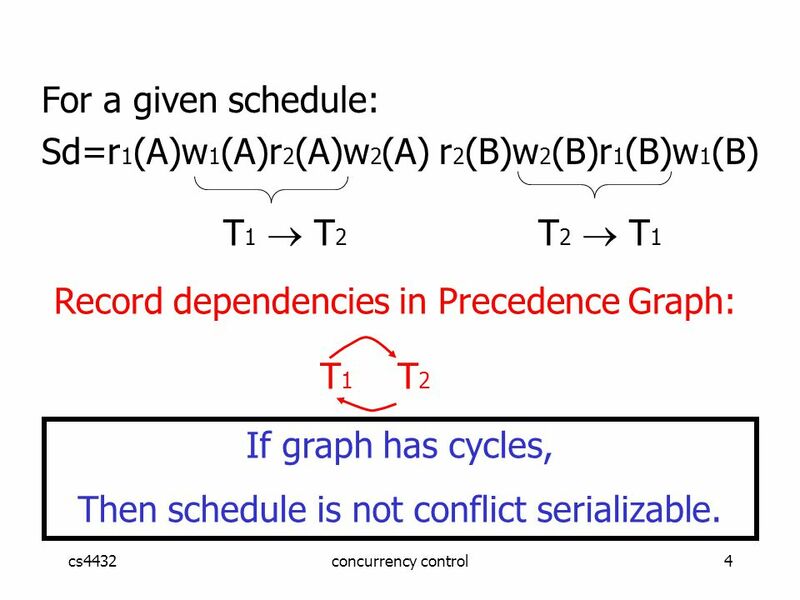 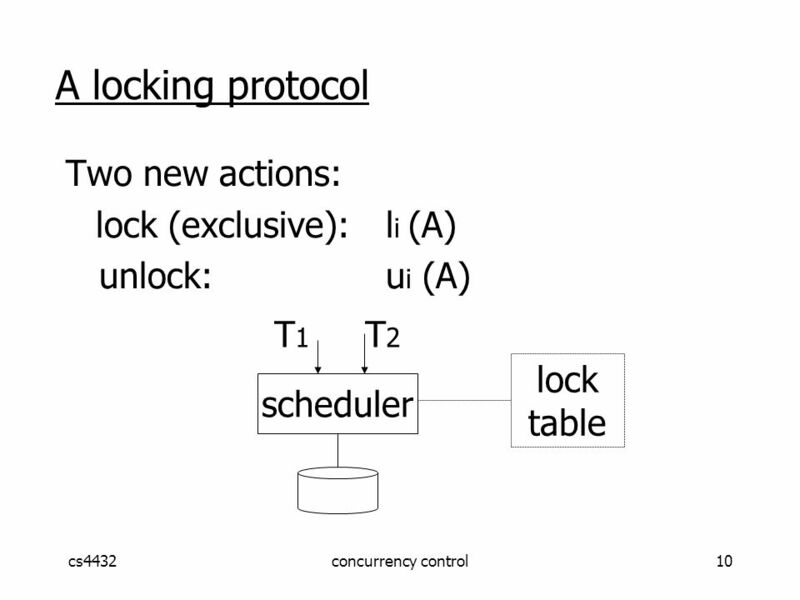 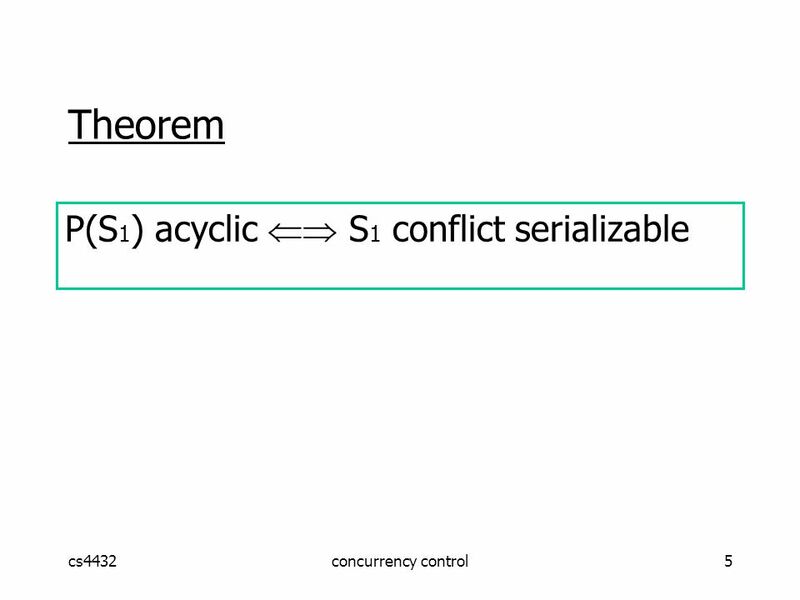 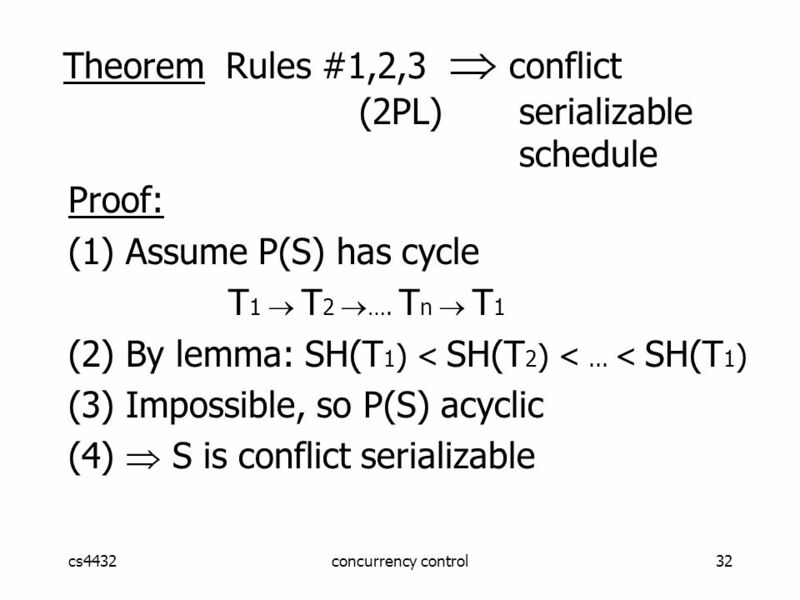 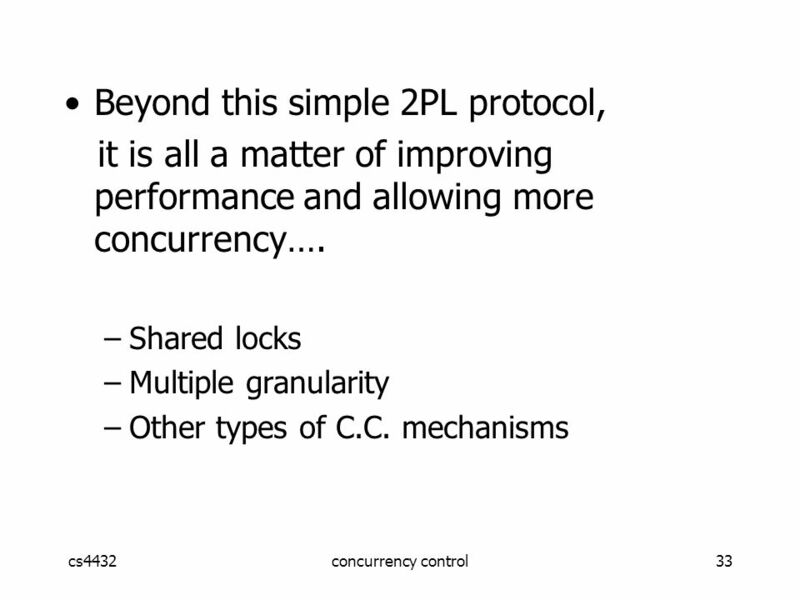 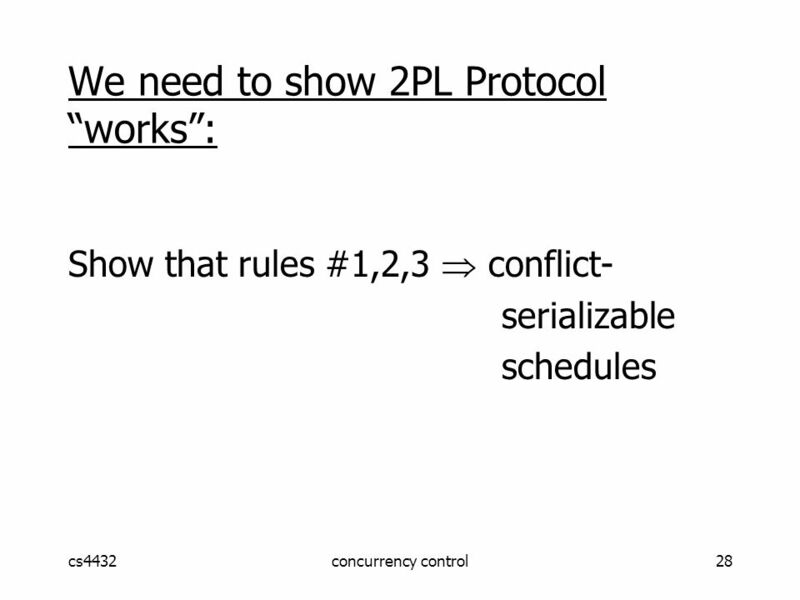 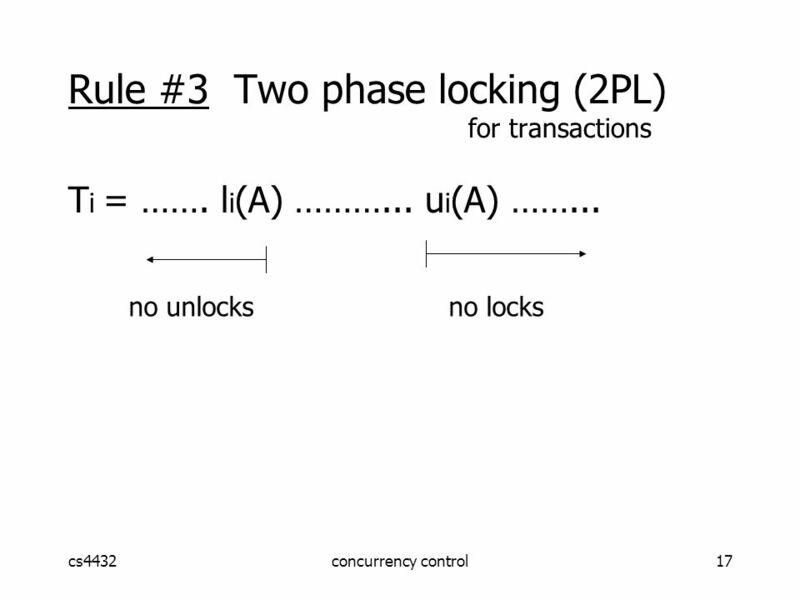 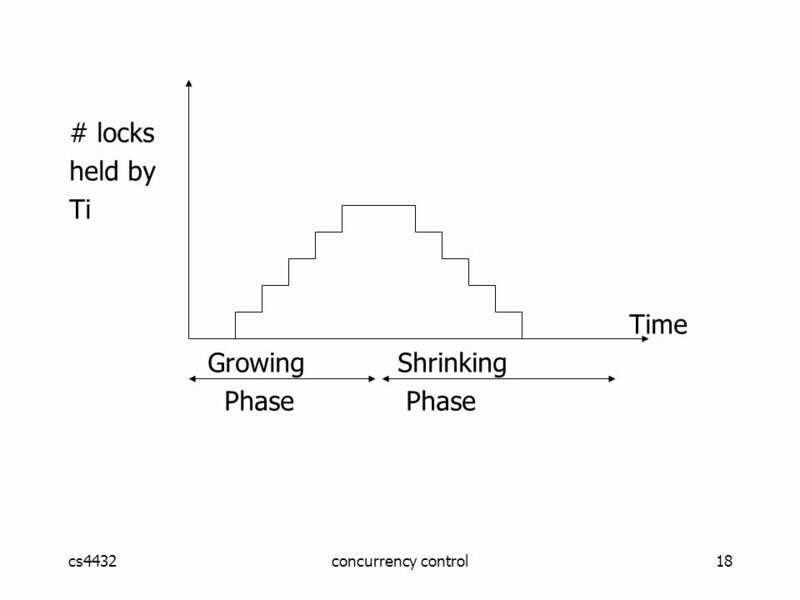 1 Concurrency Control Conflict serializability Two phase locking Optimistic concurrency control Source: slides by Hector Garcia-Molina. 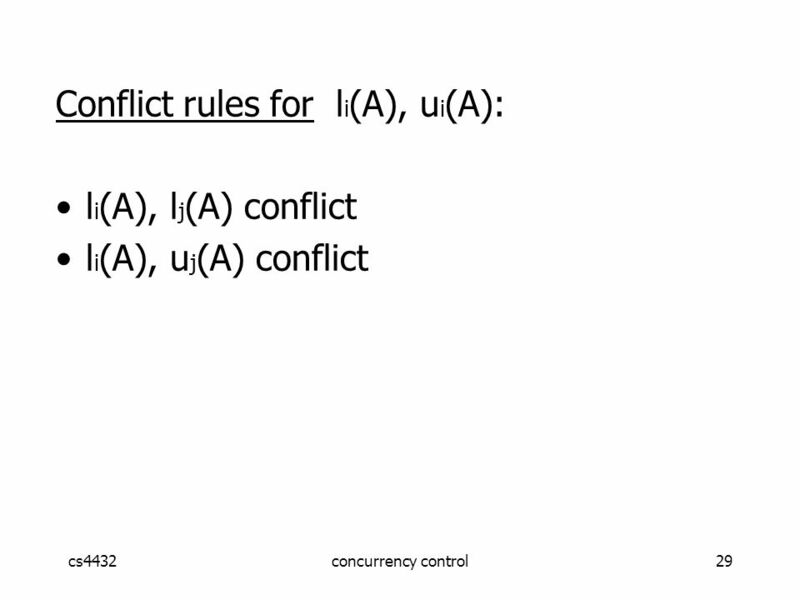 Conflict-Serializability Bharath Kumar Manur Venkataramana Class ID No:- 110.